Dice some plum tomatoes and put to the side (these will be used to combine with the ground turkey). Clean off the green beans and cut off the ends to any beans that need to be cleaned up and put them to the side. Place the beans on a baking sheet and spray with a small amount of olive oil spray and sprinkle with garlic powder, onion powder, pepper and seasonings – roast them for about 15-20 min. Put a little bit of olive oil in a separate pan and cook the ground turkey on the stovetop and season it with garlic, onion flakes and italian seasonings. When the ground turkey is almost done, add the diced tomatoes, mushrooms and tomatoes to the mix and let them cook down. Once the turkey is done cooking, and the pasta is done cooking combine the two. Add a little bit of olive oil on top, and mix the entire pasta dish. 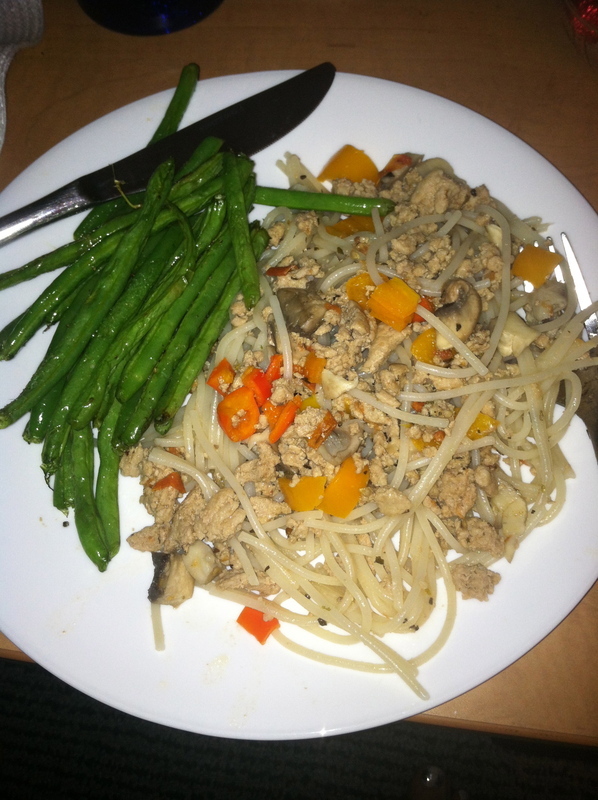 I loved this dish, and will definitely be making it more often! Hope you love it too! 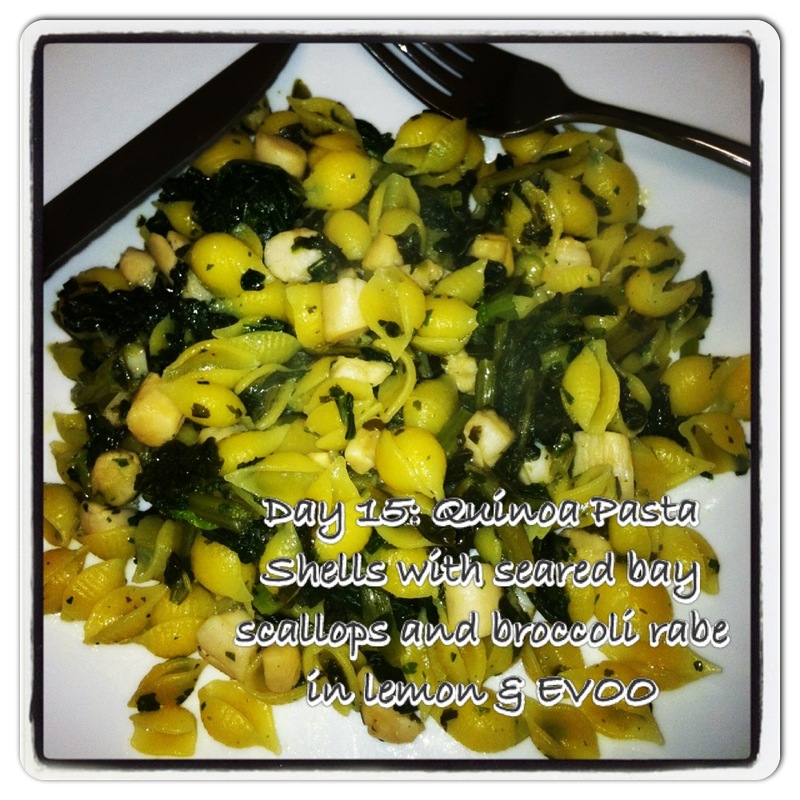 This meal was quick, easy, tangy and tasty :). LOVE! Place frozen Kale in a pan on the stove with 1/8 cup water and turn on a medium heat to defrost. Sprinkle the burger with either minced garlic or garlic powder (depending on how potent you like it) and lemon juice as it cooks (both sides). 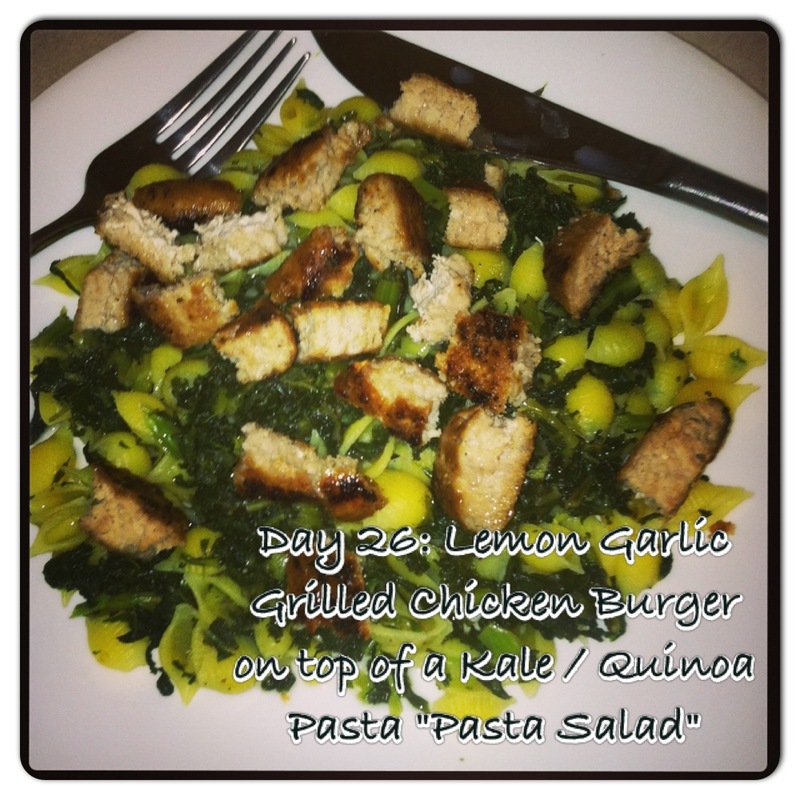 Place quinoa shells on plate, top with lemon / garlic kale and top with garlic / lemon burger. I am obsessed with broccoli rabe, but some people aren’t too fond of the bitterness – so, you can always replace broccoli rabe with regular broccoli / spinach or kale! This recipe is super simple, and can be put together in under 20 minutes (which is key when you’re running around like I am). 3 oz Pre-Cooked Frozen Shrimp (Peeled & Deveined) – Some people disagree with using frozen shrimp, I have no problem with it – but, if you’d rather use fresh shrimp you can get it at any grocery store / seafood shop. 10 oz Frozen Kale – Again, some people prefer fresh.. but I like to be quick, so frozen works for me. I make the full 10 oz. because – well, who won’t eat leftover kale?! 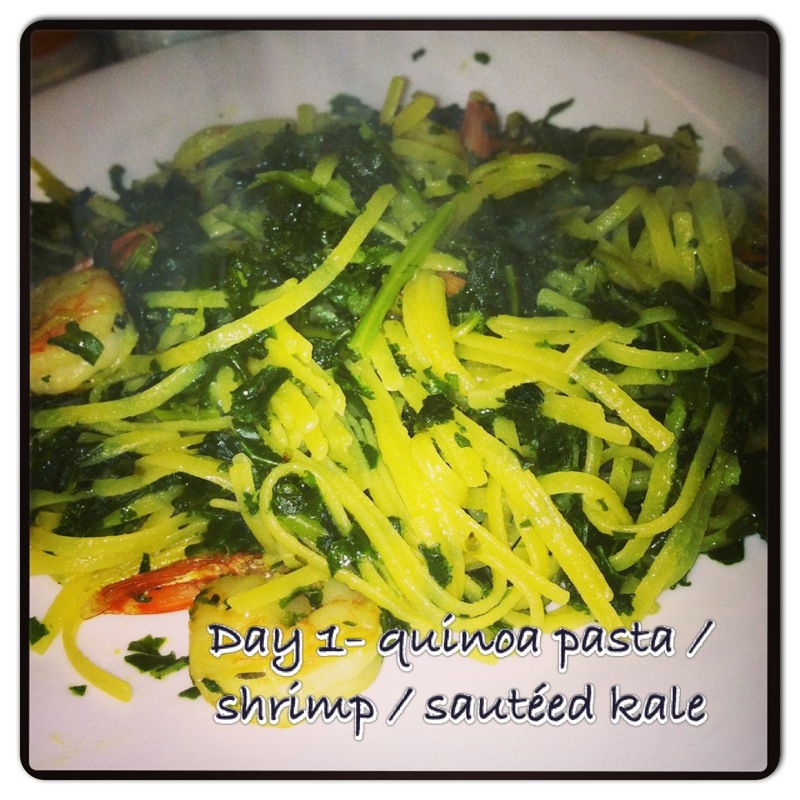 Once the Pasta is finished Mix the Sauteed Kale and Shrimp with the Pasta (along with the oil / garlic sauce leftover).